Every volunteer and staff member has a few collection items that capture their imagination in a special way. We started a series in our monthly newsletter to highlight these items and share them with the museum community. "The Germantown Historical Society and its umbrella organization, Historic Germantown, are stewards of a collection of thousands of three-dimensional objects documenting the history of Germantown, from its 1683 founding to the present. One such object - the so-called Johnson Fence - is a favorite of mine, an object I love. We received this worn section of fence in about 1915 from an unknown source; our accession books document the donation of the fence, but no information is available about who gave it to us. This section of fence stood adjacent to the Keyser-Elwood Johnson House at 6316 Germantown Avenue. The fence bore witness to the Battle of Germantown on October 4, 1777. 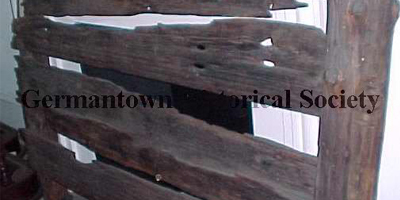 Several holes are present within its time-worn planks; these were made by fired musket balls striking the fence. A couple musket balls were found embedded in the wood; these were saved and donated to the Germantown Historical Society as well. A photograph from circa 1900 shows the stubborn old fence still standing, almost 125 years after the Battle was fought. Over 100 years have passed since this section of fence was donated to us; we are most grateful to the curators of such an unusual and venerable witness to history." "As the Midwest's only major radio and television institution, the Museum of Broadcast Communications in downtown Chicago is an experience of broadcasting history and wonder with an archive of nearly 100,000 hours of programming including more than 10,000 commercials dating back to the 1950s. The MBC also has on display many broadcast artifacts including one of the cameras that telecast the first of four televised presidential debates between then Senator John F. Kennedy and then vice-president Richard M. Nixon. 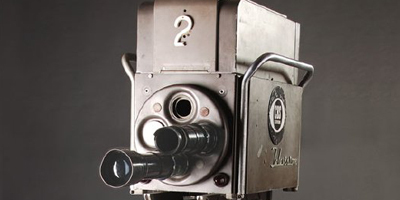 The camera, designated Camera #2, is a RCA TK-11, a black and white unit that focused on Kennedy during their first debate in Studio 2 of WBBM-TV on September 26, 1960. While three other debates were scheduled in other cities, the first is referred to as 'The Great Debate' and to many viewers, the decision maker for the next president." 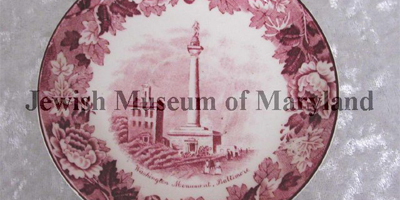 "This transferware saucer shows an idyllic little view of Maryland's Washington Monument (the first monument in the country dedicated to George Washington, as we'll happily remind you). Part of a series of 'Old Baltimore Views', the saucer was made in the early 20th century for Hochschild, Kohn & Co., one of Baltimore's largest department stores. Like many of the city's major retail outlets, Hochschild-Kohn was founded and owned by Jewish merchants, and for many decades it staked a claim on the hearts (and the wallets) of Baltimore residents. I love this piece not only because I am a fan of transferware ceramics, but also because it demonstrates that so much of our mission can be reflected in one small artifact: Maryland history, the history of the local Jewish community, and the everyday lives of those community members...shopping at Hochschild-Kohn, bringing home some commemorative china, and drinking tea." "One of the most interesting items in our collection is the Tug-of-War Trophy won by the 'Men of Might' from Zorra Township. Tug of war became popular in the 19th century and reached a peak of importance during the 1880s and 1890s throughout Canada, the United States and Europe. The township of Zorra had a tug-of-war team which became world famous in the 1890s. The 'Men of Might' were formed in 1870, a group of men of Scottish descent from the Zorra area who quickly succeeded in defeating all others in county competitions. The group, consisting of Alex Clark, William R. Munro, Robert McLeod, Ira Hummason, Robert McIntosh and their coach Ebenezer 'Little Abe' Sutherland. In 1888 the "Men of Might "enter a competition in Buffalo, New York and it was here that they shocked their competitors and became American champions. The Chicago Highland Association contested their title and invited them to a match in Chicago in 1890. Due to unfair regulations imposed by the opposing team, they were defeated for the first time. In a rematch which was held the same year at the Embro Fair, the team emerged victorious again. At the World's Fair in Chicago in 1893, the group competed against numerous teams from all over North America and Europe. After a heated competition they again emerged victorious. Thus, they became the world champions and winning the fabulous trophy now housed at the Woodstock Museum NHS." "This artifact is rather unusual for a small historical museum in Central Indiana to possess as bears have been rarely seen in Indiana since the time of our early pioneers. However, this 7 foot 6 inch tall Kodiak Bear is a key artifact in the collection of the Monroe County History Center. The mount came to the History Center from the Schmalz family, who owned a long-standing department store in Bloomington, Indiana. The owner, Roy Schmalz, was an avid hunter and traveled the world big game hunting. Among his trophies are a buffalo, cougar, polar bear, moose, and this artifact, a Kodiak bear. Mr. Schmalz received permission to hunt the bear from the Federal Government in 1949 because at that time, Alaska was not yet a state in the Union. Kodiak bears live exclusively on the Kodiak Islands in Alaska. This bear made its way into our museum because its taxidermy form became a local fixture in Bloomington for a number of years. Mr. Schmalz sold hunting gear and also displayed his hunting trophies in his department store. Many local adults remember as children going into the department store and seeing the bear. Once the store closed in 1988, the family donated the much loved bear to the Monroe County History Center. 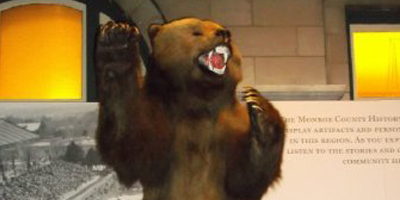 In 2013, the History Center sponsored a local school contest to name the bear, and 'Monroe' was the hands down favorite. 'Monroe' still greets visitors as they first walk into the exhibits galleries, and can be heard roaring throughout the museum!" "One of my very favorite archival collections from the Museum of Contemporary Art of Georgia is the TABOO Papers. TABOO, active from 1988 - 1999, was an Atlanta based artist collective that aspired to provoke and generate dialog about subjects considered to be "Taboo" in the politically correct and respectful populace of the South. They often used humorous, sardonic, and quite often outrageous exhibitions and projects to inspire discourse. 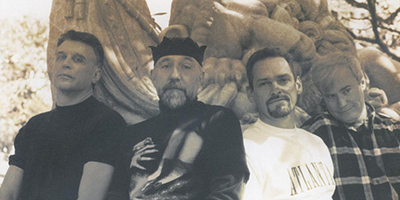 Over the period of 11 years, the four members Larry Jens Anderson, Michael Venezia, King Thackston, and David Fraley curated and often included their own works in a number of exhibitions. They also created several related activist projects. Their goal was to destabilize and challenge narrow-minded beliefs about homosexuality, AIDS, death, love, Southern identity and numerous other topics, and they did it with a great amount of wit. Many of the artists that participated in the TABOO exhibitions over the years are also found within the MOCA GA permanent collection, including works from three of the four founding members, and many more have participated in MOCA GA produced exhibitions. 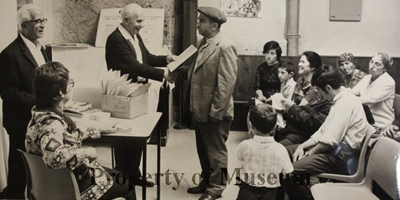 The fact that researchers can come to MOCA GA or visit the website and find both visual examples of artwork, biographical information, and all sorts of great additional information about projects and exhibitions in which they took part is very fulfilling for me as a museum and archives professional." 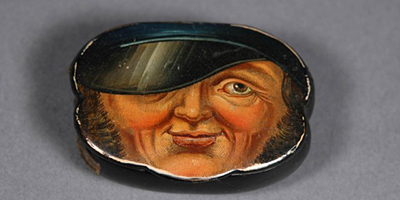 "I love this snuffbox because of its large, engaging graphic of a 19th century working man's face, cheekily peeking out from beneath the visor of his black cap. He could be a bricklayer, sailor, cab driver, bartender or cobbler - he is the working class 'any man' of his time, and his pleasant expression is likely meant to be a selling feature of this container. The box is not in the best condition, but the graphic can still teach us about the history of men's fashion! This fellow sports muttonchops (an extravagant style of sideburns - also known as sideboards or side whiskers), which extend from the hairline to below the ears. The term sideburns is a 19th-century corruption of the original burnsides, named after American Civil War general Ambrose Burnside who was known for his unusual facial hairstyle that connected thick sideburns by way of a moustache, but left the chin clean-shaven. In period literature, 'side whiskers' usually refers to this style, in which the whiskers hang well below the jaw line. As with beards, sideburns went quickly out of fashion in the early twentieth century. In World War I, in order to secure a seal on a gas mask, men had to be clean-shaven (this did not affect mustaches)." 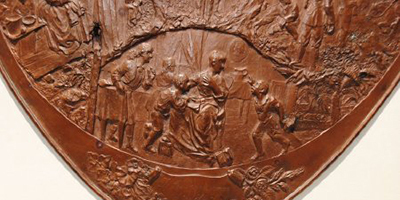 "This is a bronze engraved shield, 22 inches by 18 inches, titled 'To the Brave Women of the South.' It is one of only three known to exist. 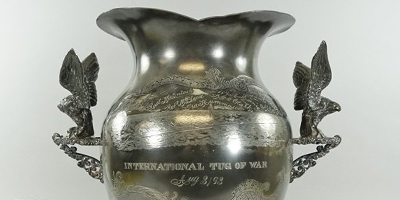 Engraved in the late 1890's by Adalbert Johann Volck, it features nine small vignettes depicting the part that southern women played on the home front during the Civil War. It begins with the soldier leaving his family, continues with the trials at home during his absence, and ends with the return of the soldier. Most other pieces of art that feature southern women and their roles during the Civil War only feature one scene, so the fact that this piece features nine scenes makes it truly unique." "Aspen in the late 1960s was a popular place to drop out and escape the Vietnam War draft and the conformity of America. Young artists, hippies, radicals, and outlaws arrived in late 1967 after the famous Summer of Love in San Francisco, abandoning the city to seek a new kind of refuge in the natural beauty surrounding Aspen. Aspen had become fertile ground for the battle between conservatives and hippies because of an influx of intellectual, liberal, and unregistered voters who had moved there in the preceding years. 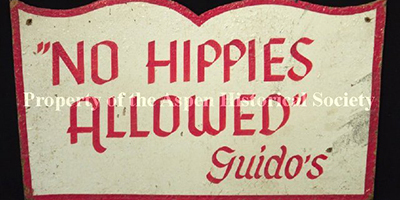 Adding to the problem was the constant harassment of hippies though heavy handed local law enforcement. One defendant, a 15-year-old hitchhiking his way through town on his way to San Francisco, had been detained and sentenced to 90 days in jail in municipal Judge Guido Meyer's infamous magistrate courtroom. Meyer was notorious for his militant opposition to the influx of what he called "undesirables" into Aspen, often sentencing youth to ninety days for petty offenses. When Joe Edwards, who had recently been licensed and who had never before tried a case in court, heard about the unrepresented youth languishing in the local jail, he brought the first civil rights case in Colorado to court by suing the Aspen Police Department, the City of Aspen, and local magistrates for harassing the hippies and violating their civil rights. At the hearing in federal court in Denver in 1968, the judge in the case castigated the police force and magistrates and threatened to issue an injunction if any more people were discriminated against, harassed, or unjustly imprisoned. Edwards became a hero overnight in Aspen for defending its burgeoning counterculture. This sign reminds us of a time when there was unrest all over the country and even managed to come to a sleepy town in the mountains of Colorado. A time when a young generation was questioning and fighting against the establishment, and who ultimately helped shape the town of Aspen as it is today. You can find this and over 12,000 more objects and images on our on-line site." "In 1917, after failed campaigns to hold the party in power responsible for woman suffrage and therefore push President Wilson and the Democrats out of office, the National Woman's Party (NWP) turned to a new tactic and began picketing the White House. Pickets were held daily and even included a picket on Sunday for working women who could not take off work to picket for fear of being fired. 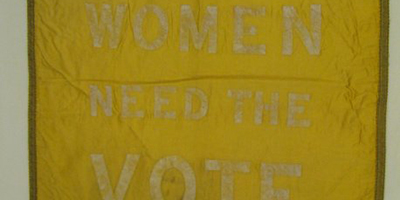 Though faded, this banner is particularly special to us because of its significance as a physical item showcasing the tactics of the NWP in their fight for suffrage and because it speaks to the collaborative reach as the NWP worked with other interest groups for woman suffrage. It's also timely as we celebrate Labor Day this month. This banner was one of many carried on the picket line by the NWP. We have many more banners in the collection, but we are also missing a large portion, as banners were ripped apart by angry onlookers, or perhaps taken home by pickets and today mostly likely remain in private hands. Learn more about our #CircleofSuffrage initiative here http://nationalwomansparty.org/join-the-circle-of-suffrage/ and contact the National Woman's Party to contribute your story." "A little girl's shoe was found within the walls of a home in Sycamore, IL when it was undergoing reconstruction. The black shoe is made of soft, very worn leather and has 6 buttons and most likely dates from the early 1900's. We have established only the where factor of our shoe mystery but we are not able to determine the "when and why" factor. A common reason for hiding shoes in walls during construction seems to be a belief held worldwide of good luck or warding off the devil. Perhaps the parents of the child believed that hiding the shoe in a wall would bring them good luck. 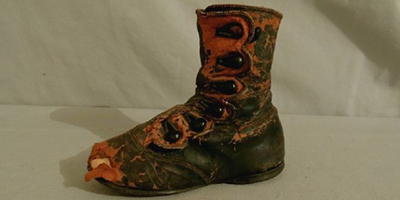 Although our mystery most likely will not be resolved, our museum staff and volunteers like to believe the little girl's hidden shoe did bring good fortune to her and her family in their new home." "This photograph is part of our collection of Press Photographs. Each photograph has the byline, date and caption of its publication on the reverse. The entire collection is precious to me because of the immediacy of the course of human history it conveys. In this particular photo, feelings of pride, joy and anxiety are so obvious. The face of the older man being sworn in as a new citizen of Israel shows his anxiety at the changes he has endured, and will continue to endure. Is it his wife sitting nearby whose face radiates pride, or perhaps the anticipation of the freedom and opportunity waiting in their new homeland?" "This large and wonderfully fanciful needlework was created by Sarah E. Anthony of Smyrna, Delaware for display at the Centennial Exposition, held in Philadelphia from May 10 - November 10, 1876. Although the main purpose of the fair was to showcase the best and brightest in science, technology, and industry, it also featured a women's pavilion that offered ladies a chance to showcase their talents and compete for prizes. This needlework made its first appearance there as part of the exhibits. Measuring 48 ½ inches high by 38 ¾ inches wide, this imposing framed piece is definitely the largest embroidery item in our collection and a real visual feast that perfectly captures both the international flavor and Colonial Revival spirit of the exhibition. Not only does it feature a wonderfully eclectic variety of symbols that really cover all the necessary nationalistic and patriotic bases, it also won a medal for Originality in Design and a diploma for Excellence in Workmanship. Perhaps best of all, we know exactly what Mrs. Anthony was thinking when she created it because her explanation of all the symbols is preserved in a printed silk plaque that accompanies the piece. This item is a spectacular achievement and really wows visitors of all ages. There is so much to look at and everyone finds something different in it to be fascinated by." "If you are like me, you likely encounter a particular red and white, triangular-shaped traffic sign each and every day. You know that as a driver you are to yield the right of way to crossing traffic. Drivers weren't so sure of what this new sign meant when the first two yield signs in the world were installed at the intersection of 1st Street and Columbia Avenue in Tulsa, Oklahoma on a cold January day in 1950. The concept for this new traffic sign came from the genius of a Tulsa policeman Clinton Riggs. This above-named intersection had proven to be the location of the most traffic accidents in the nation's "Oil Capital" and Riggs set out to do something about it. The city attorney balked at the idea, stating that it would cause too much confusion for drivers and would possibly lead to a great number of traffic incidents and lawsuits against the city. 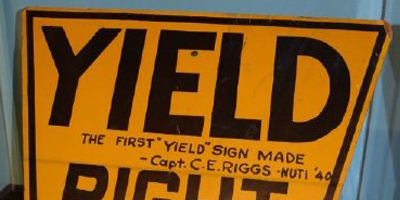 Riggs, thinking the sign would actually make collision liability more clear, ignored the perspective of the city attorney and went ahead with the design and installation of his yellow and black keystone-shaped yield signs. (The current style was adopted in the U.S. in 1971.) By the next year, the intersection had dropped from its position at the top of the list of dangerous intersections to number seven. The yield sign had worked. More were installed across the city and eventually this practice spread to other cities and towns. Now the sign is in use in countries all over the world. After his retirement, Mr. & Mrs. Riggs traveled the globe taking with yield signs of all designs they stumbled upon in the countries they visited. These photographs as well as the first yield sign erected in Tulsa was donated to the permanent collection of the Tulsa Historical Society & Museum in 2005." "When one thinks of World War I they picture the battle scarred terrain that covered much of Europe. But it is the images of the everyday life that intrigue me the most. 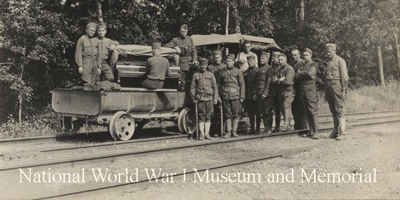 Even though faced with the harsh realities of modern warfare, many of the images in the National World War I Museum and Memorial's collection show young men smiling and carrying on with life. From the service of Edward J. Ochse, 137th Infantry, 35th Division, this photograph has always intrigued me. Where were they going with this piano and could they not have chosen a lighter instrument to carry with them? Perhaps the non-smiling men on the right were the ones responsible for loading and unloading the piano. I just hope the piano stayed in tune for its grand tour." 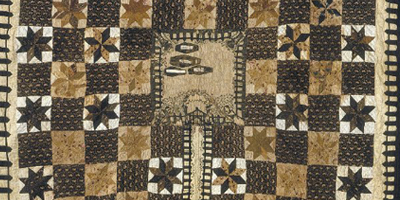 "The Graveyard Quilt is one of the Kentucky Historical Society's best known pieces. Because of this almost every staff member that deals with collections has developed a relationship with it. 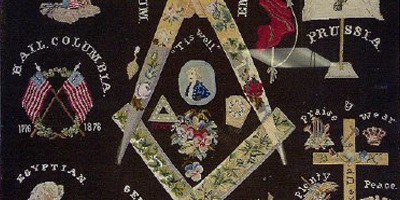 The quilt was made by a woman named Elizabeth Roseberry Mitchell as a mourning piece. The quilt has an unusual design with a border of appliquéd coffins and a picket fence and a cemetery in the center. Ms. Mitchell placed paper tags on each coffin with a family member's name on it and when that family member passed away she would move the coffin to the center graveyard. The rest of the pattern features 8 pointed stars alternating with blocks of brown calico. The thing that most people don't know about this piece is that there is a second one. Ms. Mitchell began making a second quilt. The quilt top was finished but the batting and backing were never attached. Both the completed quilt and the quilt topper are housed in Kentucky museums. The quilt is at the Kentucky Historical Society in Frankfort, Kentucky and the quilt top is at the Highlands Museum in Ashland, Kentucky." 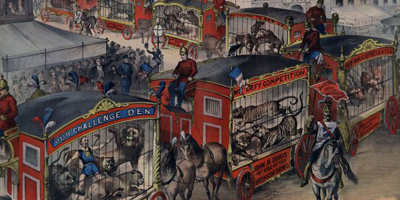 "Circus posters were created to capture the imagination and draw audiences to the show. Sometimes exaggerated, often colorful, posters were printed and distributed by the thousands. They were never meant to last more than a few weeks which is why it is amazing that any survive for us to admire today." This poster was chosen by archivist Pete Shrake because "it documents a relatively unknown circus and illustrates a classic scene, a street parade. Thanks to the date tag at the bottom, we also know exactly where this poster was used, Providence, Rhode Island on July 11, 1883." "This photo is an early map of the then-new Baltimore Beltway highway system. The BGE Photo Collection at the BMI contains some of the only existing photographic documentation of the construction and opening of the Baltimore Beltway (I-695). Dating from 1962, this image is an anomaly within the collection - whereas most images are photographic, this image is actually a photo of a map used to promote the new highway that was used internally by Baltimore Gas & Electric. The Baltimore Beltway allowed Marylanders to circumvent Baltimore City without actually having to go through it - either down stop-and-go city streets or through the Harbor Tunnel. 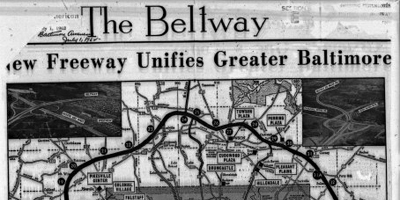 The most curious aspects of this photo are what isn't pictured: despite the title's claim that the road "unifies Greater Baltimore", in actuality the eastern suburbs are not served by the new highway at all - all of this would change in the 1970s when the I-695 Beltway "loop" was completed on the east side with the construction of additional roads and the Key Bridge. Further unifying the city and its suburbs in the 1970s were the Fort McHenry Tunnel and the construction and interchanges of Interstate 95 in Baltimore."